1.After working of bending and film vanishing . 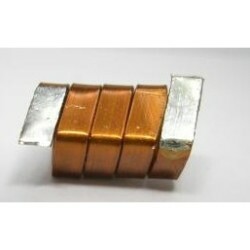 2.High current inductor with ferrite core PQ series. 1. COIL WINDING MADE OF FLAT WIRE (Recently 1.0x0.2mm~ 10x0.8mm). 2. CUSTOMED DESIGN FOR POWER TRANSFORMER.